Despite the odds of finding Alya five years later in post-Ebola Guinea, his Kiwi surgeon searches for the now 10-year-old. Dr Neil Thomson wants to see the long term impact of his surgery which removed the life-threatening yet benign tumour from the boy’s throat. Soriba sits on a stool at the end of an empty hospital bed waiting for news of his son Alya, who has been in surgery for nearly three hours to remove a tumour from his small neck. Across the hallway of the hospital ship, Alya’s Kiwi volunteer surgeon Dr Neil works finishes up the successful surgery. ‘Incredible!’ he declares. Alya’s tumour had grown around the eight-year-old’s windpipe. ‘He was a few months away from suffocating from this.’ In his short life, the tumour on Alya’s neck since birth grew from the size of a twenty cent piece to the size of a potato. 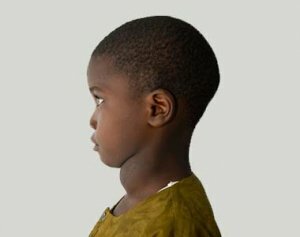 But after free surgery onboard the Mercy Ship only a crescent-shaped scar remained where the tumour used be slowly squeezing the breath from the little boy. Another patient chimes in from a bed nearby, ‘Let God bring these kinds of people every year in this country!’ ‘Amen!’ declares Soriba. Four days later, a squirmy Alya sits on his knees at the end of his hospital bed, pulling on his father’s shirt. Ready to head home to his village, he is no longer the little boy who can’t catch his breath. He is no longer exhausted from his hindered breathing. Thanks to our sponsors and volunteers, the free operation Alya received changed and transformed his life. Alya now has a future. ﻿Like boys the world over, Sema is fascinated by planes. As they flew over his home in Conakry, Guinea he would track their course – dreaming about working on one someday. But Sema couldn’t attend school because of his severely bowed legs, and his family couldn’t afford the expensive, limited specialist care in the city. As the eight-year-old stood his straightest, his knees remained 16cm apart. Hope for the future spluttered to life when Sema’s family heard a Mercy Ship was coming to Guinea offering free surgery that could correct conditions just like his. 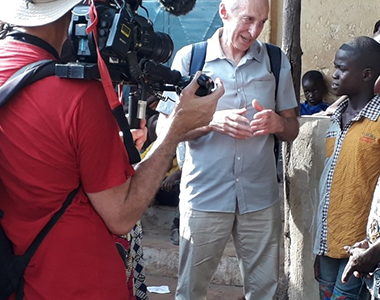 It seems too good to be true, but finally Sema had hope that things could change for him; hope that he would no longer be rejected by other children because of his deformity. 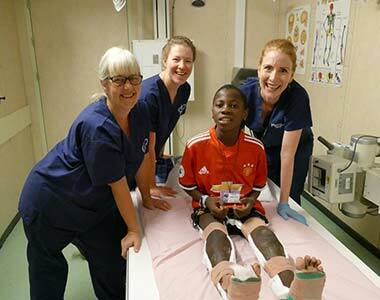 Sema receive complex orthopaedic surgeries on both his legs, provided by the team of volunteer specialists onboard the Mercy Ship from New Zealand and around the wold. The road to recovery was a long one, but when his legs casts were finally removed, Sema could hardly believe his eyes – his legs were healed! But now he had to relearn to walk. Each day Sema heroically pushed through his physiotherapy tasks, cheered on by his nurse Robyn from Wellington, Emma from Hawkes Bay and the other Mercy Ships physios developed a rehabilitation plan for Sema to regain his balance and strength. His confidence grew each day as his steps became surer until he could walk and balance on his own. 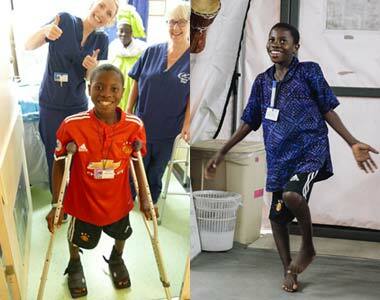 At last Sema was ready for discharge – standing on his ‘new’ legs and 8 cm taller than when he first arrived on board! Now that’s something worth grinning about! Nabinti’s husband had died 10 years ago, and she was now the sole bread winner for her family. She would buy a large sack of rice, and then divide it into small packets to sell to her neighbours for a meal at a time. 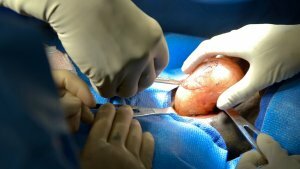 But as the 35 year-old ‘s tumour grew, sales dropped off. Nabinti eventually lost her entire livelihood because people became afraid of her. 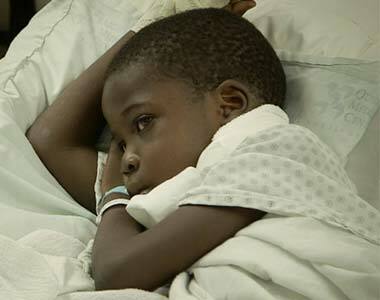 They were terrified that her tumour was contagious and they too would become affected if they bought her rice. Her family was living on the bread-line; there seemed to be no hope for Nabinti to receive the medical help she needed in Guinea, West Africa. The required surgery was not only well beyond her financial reach, there was simply no one around who could perform the specialised and risky procedure. 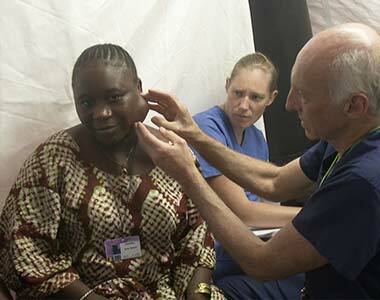 The removal of Nabinti’s tumour by volunteer Kiwi surgeon Dr Neil Thomson saved her life. ‘She had a carotid tumour – it developed on the side of her neck, where the carotid artery branches into smaller blood vessels to carry blood to the brain. It growing through the nerves in Nabinti’s face,’ Dr Neil explains. Dr Neil and the surgical team painstakingly removed the mass as well as the multitude of fingers reaching through her nerves. ‘It was complex and invasive,’ summarises Dr Neil. The tumour’s disappearance from her face restored the confidence of Nabinti’s community. She could return to selling rice and could once again provide for her family. She was no longer shunned and ashamed. When her tumour was removed free of charge on the Mercy Ship, everything changed for Nabinti! 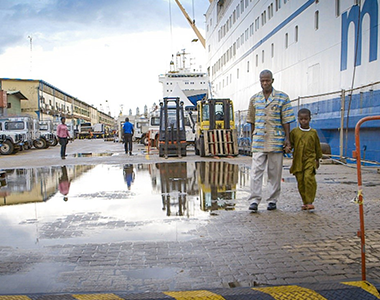 Mercy Ships uses hospital ships to deliver free world-class health care services, capacity building and sustainable development aid to those without access in the developing world.